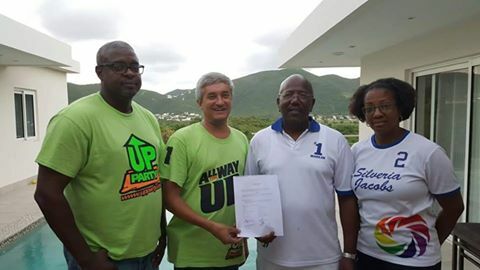 PHILIPSBURG–The existence of “hefty contracts” for cleaning around utilities company GEBE’s meter boxes and houses as well as one for former Minister Maurice Lake totalling some US $12,000 per month for the post of advisor to the board is questioned by Member of Parliament (MP) Tamara Leonard of the United People’s (UP) party. She has put her queries before Energy Minister Christophe Emmanuel in a letter calling for answers. Leonard said she had questioned the contracts, said to be to the tune of some US $900,000 per year for removal of debris, grass and weeds from around the meter boxes along the public roads, in last month’s Parliament meeting with Emmanuel, but was not given the answers. “The information given did not deal with the contracts and just skirted the issue,” said Leonard, who was not present in the meeting when Emmanuel delivered the answers. She was off-island due to a medical emergency and was absent with notice from the session. “The state of affairs at GEBE appears to be clouded more and more in offhand information and Members of Parliament, the representatives of the people, are left only to guess what is happening with the finances of this vital company,” she said. Leonard added that she had been prompted to raise the issue of the GEBE contracts after learning that one has been or will be offered to former Energy Affairs Minister Maurice Lake, or a company he represents, for the post of advisor. “I can only express astonishment at hearing this. Was this position advertised? What is the role of this advisor? Has there been a similar person appointed in the past and, if yes, who was it and what happened to them?” she questioned. Leonard said it was a matter of grave importance for Emmanuel to give the answers about the contract. “We are all professionals and respect each other as such. However, when such a hefty sum is attached to a post and it is handed out in what can be deemed a political appointment, answers are needed,” she said. Answers are even more needed taking into consideration the statement in the 2016 Annual Report of the General Audit Chamber which clearly points out that political appointments are still very rampant in Government, Leonard said. “GEBE is not the only Government-owned company where this is seen very publicly. A similar situation has been clear to the public at Princess Juliana International Airport and the St. Maarten Telephone Group of Companies TelEm,” she said, adding that she hopes to get answers as soon as possible on the topics raised in her letter.